Montgomery County flourished during the nineteenth century. With the completion of the Miami and Erie Canal in 1829, Dayton was connected to Cincinnati. In addition, nine turnpikes connected Dayton to other parts of the state. 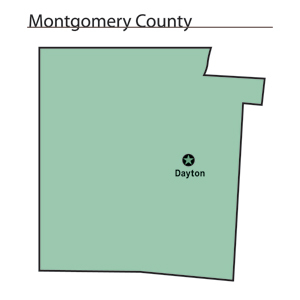 Because it was a transportation hub, Montgomery County was heavily involved in Ohio's early industrialization. By the late 1800s, the county had become the home of many different businesses. There were a number of newspapers and journals that fueled a publishing industry. Many of these publications dealt with either religious issues or agricultural interests. Some examples include Christian World, Young Catholic Messenger, Ohio Bible Teacher, as well as Farmer's Home, the Ohio Swine Journal, and the Ohio Poultry Journal. Many other businesses were related to agriculture and included mills and a number of companies manufacturing farm implements. Among the best known in the nineteenth century was the Buckeye Mower and Reaper Company. In the 1880s, John Patterson opened the National Cash Register Company in Dayton. Today, service industries, such as health care and tourism, retail positions, and manufacturing businesses are Montgomery County's largest employers. Government ranks a distant fourth. Most government employees work at Wright-Patterson Air Force Base. In 1999, the per capita income in the county was 28,113 dollars, with 11.1 percent of the people living in poverty. Most voters in Montgomery County claim to be political independents. Besides the Wright brothers, Montgomery County also was home to Ohio Governors James Cox and Charles Anderson. Paul Laurence Dunbar, a noted African-American author and poet lived in Dayton as well.